Nervous Air - Over my history of contests, all-state tryouts, chair tryouts, job auditions, recitals, feature solos, etc…, I’ve experienced at least two symptoms of nervousness that affect the performance. Recently, I played a recital and experienced Nervous Air again. As an adult clarinetist and professional, you would think I’d get over this condition. Well, it crept up on me again on this particular performance. Practicing at home or in the practice room is definitely different than playing a performance in front of people. This is why playing a “quasi-public performance” before the public or judged performance is a good way of “practicing nervousness.” Play for your parents, grandparents, musical colleagues or anyone who will listen before your real event. Now, what is Nervous Air? 1. You start the music without a full complement of air. For some reason, our nervousness of playing in front of an audience makes us breath with a shallow breath. 2. You get through a few phrases and probably take more shallow breaths. 3. You probably breathe more often than you did while practicing, all of a sudden all of the shallow breaths add up and your lungs are too full. 4. Now, with the excess air, you have to find a place to exhale. Hopefully, your music allows for it; otherwise, you might have to intentionally drop a few notes. So, how do you fix Nervous Air? Yes, when you are practicing the music for your recital or solo, intentionally practice and think through your phrasing or breathing spots. MARK THESE INTO YOUR MUSIC. Remember, music has phrases. These phrases turn out like musical sentences. You want to breathe in spots that are correct, or your music performance will sound very choppy. BEST TIPS ON PREVENTING NERVIOUS AIR. 1. Breathe in BIG before you start that music. 2. Breathe to the bottom of your lungs. 3. Breathe in so much that the only next option is to blow out. You would not believe how a good, solid breath at the beginning of your piece or solo will COMFORT you and make you more at ease with the performance in front of people. What are the positive by-products of good air? 4. More confidence in performance. What are some negative by-products of bad air? 3. Your body starts to react and other parts try to compensate for the low air function (for example your neck and nasal passages start straining and trying to push the sound out). 4. You become MORE nervous as you gasp for air creating a snowball effect of nervousness. It is MOST important that you take BIG AIR at the beginning of your solo. If you do not, your recital “condition” will continue shallow breathing. To get out of this condition, BREATHE IN BIG AIR before the next movement. One of the greatest lessons I’ve learned from Richard Stoltzman is the amount of air you take in before performing. He didn’t mention it to me, he didn’t lecture about it in master class or even talk about it. When he demonstrated playing even a small musical lick he would take the TREMENDOUS amount of air. It seemed like the walls of the room could cave in. 1. Breathe in for a full measure before you play a note of music. Make of habit of this. Yes, count in 4/4 time, breathing 1, 2, 3, 4 and then start the note. 3/4 time, 1, 2, 3 and start the note. 2/4 time, 1, 2, start the note. 2. 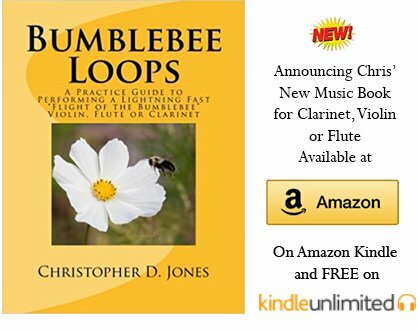 If you are playing in band or orchestra and you have two measures of rest: Breathe out for one measure and breathe in for the second measure. Always practice with contrasting dynamics. Practicing is all about internalizing good habits. Make it a good habit to play the soft dynamics soft and loud dynamics loud (and all the fun increasing and decreasing dynamics in between). Always aim for a good sound and do not sacrifice that. Remember, the better air you take, the better chance at having awesome dynamics. 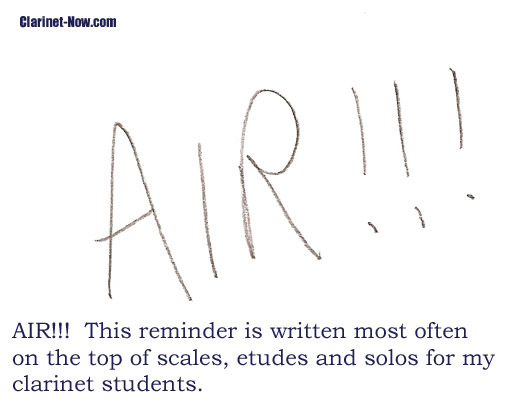 Click on the pencil marking below to learn more about Clarinet Air Support.